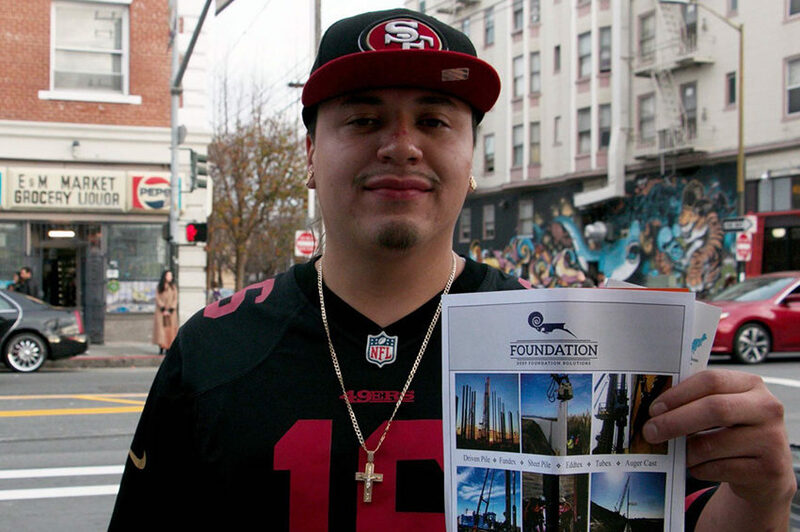 As many as 75 people gathered in the Mission on Saturday to apply for jobs to build the 157-unit, fully affordable housing project that will be built nearby, at 1950 Mission St., just north of 16th Street. Federal law requires the builder to ensure that low-income locals account for 30 percent of its workforce. Like others attending the job fair — one that lured in locals with pupusas, horchata and a DJ — Argueta was there to pick up information about unions, apprenticeship programs and jobs. And that neighborhood is changing. Up until 2002, temporary structures at 1950 Mission St. housed the Phoenix Continuation High School. The lot was then left empty until 2015, when the city purchased the property and turned it into a Navigation Center for the homeless while Mission Housing Development Corporation worked toward the affordable housing plan. Today it is surrounded by high-end yoga academies, some designer shops and “elegant imported tea” shops. And Argueta, like others, wants part of the pie that a high-paying construction job can offer. Even though the job fair was not hiring directly on the spot, more than 75 people signed in to receive more information regarding apprenticeship programs and how to become part of a union to qualify for a job. Applicants must be at least 17 years old and have a high school diploma, English skills and a social security number. “The work is hard, but the pay is good; way above the minimum wage,” said Faysal Ahmed while grabbing the flyers and information posters that were being handed out. He liked the idea of a stable job. Almost half of the recruiters on Saturday were women. 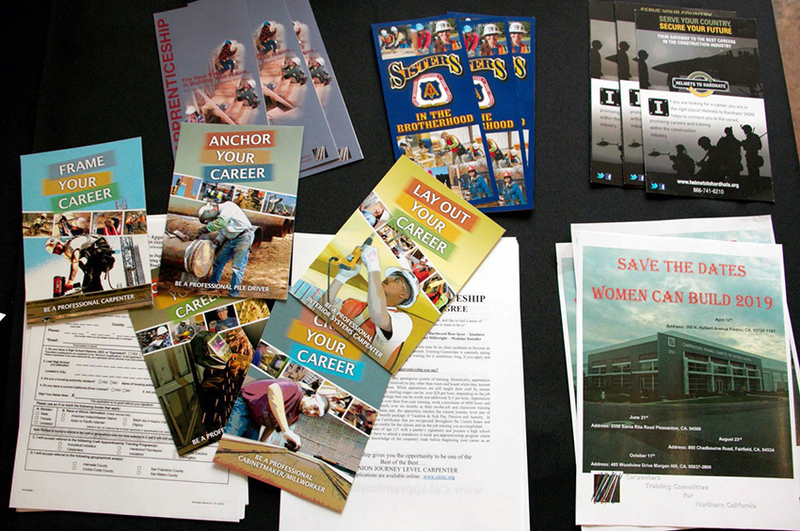 The Carpenters Training Committee handed out flyers for the Women Can Build 2019 events where they enroll women without previous experience in an apprenticeship program. Photo by Gisela Pérez de Acha. Crisia Mendoza, who just moved from Virginia for better job opportunities, was skeptical. She doubts she can get hired and it failed to help when her cousin told her, women do not build. “They say it’s heavy work for us. But that’s not true,” she said. The local hires will be working on the first fully affordable project to go up in years. Some 51 percent of the tenants have to be from the neighborhood, according to Section 3, a federal provision of the Department of Housing and Urban Development enacted in 1968. Bridge Housing, one of the developers involved in the 1950 Mission St. project, has also promised that around 30 units will be allocated to homeless people. For more information on Apprenticeship Programs and job applications visit City Build’s webpage or contact Miquel Penn from Swinerton at MPenn@swinerton.com. PreviousDo displaced tenants from deadly 22nd and Mission fire have a right to return? If you’ve only been here 10 years, YOU are the one that took a place to live from someone else. Just like the people before you and the people after you. It’s the nature of the comment that is troublesome. 50 years ago, an Irish man was heard saying, “The Latinos are taking houses away from us!”. Wasn’t cool then, not cool now. Immigrants of all kinds should be welcomed. Don’t let Trump turn you into Trump. Thank you for reporting on this 100% affordable housing development. Market/Luxury/Profit-Rate housing development fuels real estate speculation and intensifies displacement and gentrification. Until we secure stronger protections for renters from displacement (repeal costa hawkins, vacancy de-control, etc), 100% affordable should be the ONLY new housing that is built. Homes are for people, NOT profit.